The sea was totally quiet. A fresh wind brought cool air. The day was glorious. At 10 o’clock Sunday mass was held. The whole day was spent writing letters as in Bombay one could mail it home. Towards noon, the Indian coast became visible as we were driving about ten miles distant from it. Only the blueish contours of the land are recognizable. In the evening, one could distinguish numerous fires on the coast whose meaning we could not explain. 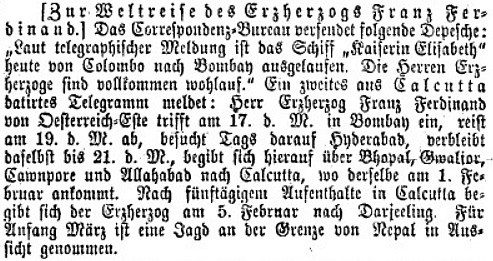 ANNO – on 15.01.1893 in Austria’s newspapers. Imperial sightseeing is covered by the Neue Freie Presse: It notes Empress Elisabeth’s visit of villas in Malaga and remarks that the Empress did it all on foot. In Granada, she saw the Alhambra and was especially charmed by the summer palace Generalife. By telegram, the world is informed about Franz Ferdinand’s travel plans in India. He is set to arrive in Bombay on the 17th and depart on the 19th on to his trip across India which will take him to Nepal. 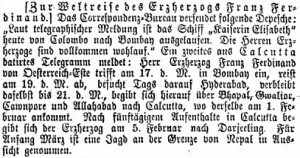 Notice in the Neue Freie Presse 15 January 1893, p.4, about Franz Ferdinand’s arrival in Bombay and his itinerary in India to Nepal. The k.u.k. Hof-Burgtheater is playing Grillparzer’s comedy „Wehe dem, der lügt“, while the k.u.k Hof-Operntheater is offering Richard Wagner’s „Rheingold“. Dieser Beitrag wurde unter diary abgelegt am 15. January 2018 von wordpressadmin.